It shouldn’t make a difference but it does - somehow food on a stick is just more fun - even more so when it’s been on a braai. Juicy meat cubes and vegetables (and yes, fruit works too) infused with smokiness, what could be better on a warm summer’s day? Pork is often the forgotten child when it comes to sosaties. More’s the pity, because pork is so affordable. You could use fillet for making sosaties, but a cut that contains more fat is ideal for the braai – enter the versatile pork neck steak. Get your butcher to cut them really thick so you can thread giant chunks onto skewers along with pineapple, red onion and green pepper. 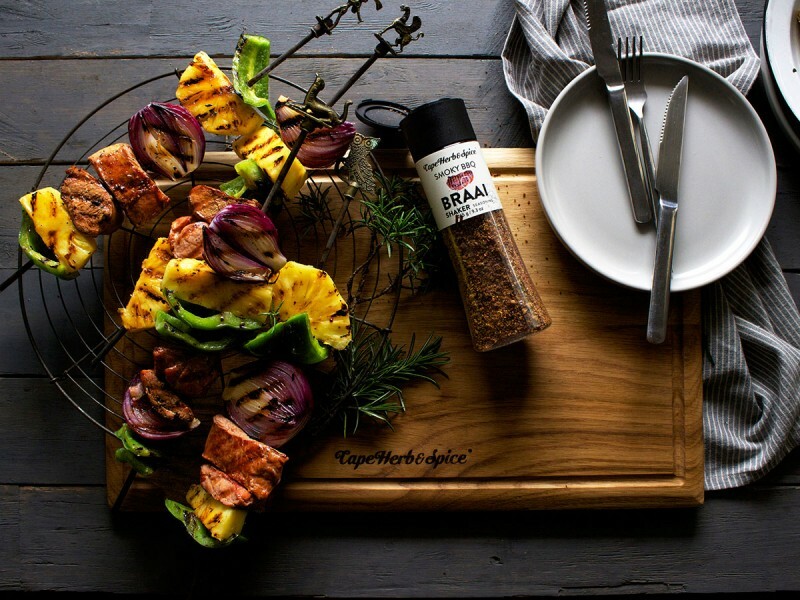 Then use the Cape Herb & Spice Smoky BBQ Braai Shaker Seasoning in your marinade and basting sauce to really up the BBQ/ braai ante. Slice the pork into large cubes, drizzle over two tbsp of olive oil, dust liberally with the Cape Herb & Spice Smoky BBQ Braai Seasoning, toss through to cover and set aside to marinade for at least half an hour. Thread the pork, pineapple and vegetables onto skewers and place on the BBQ. Halfway through the cooking, start to paint it with marinade. To make the marinade: simply mix together 3 tbsp olive oil, 2 tbsp tomato sauce, 2 tbsp lemon juice, 1 tbsp honey, 2 tsp chopped rosemary, and 1 tbsp Smoky Braai Seasoning. This recipe will serve four. If you are using metal skewers, brush them with oil before you thread on the meat. This will help to prevent it from sticking to the skewers once cooked. If you are using wooden skewers, soak them in water for half an hour first so they don’t burn on the braai. In days gone by, the fashion was to cook pork well done. Times have moved on and these days the slightest touch of pink on pork is the way to go. With its higher fat content, pork neck steaks can handle a bit of overcooking, but this is especially important if you are working with a drier cut like pork fillet. Add this seasoning to beef mince to make fabulous smoky burger patties for the braai. Make an onion relish for your ‘boerie’ rolls or hot dogs by simply frying finely sliced onions in olive oil over a low heat with a generous sprinkling of this spice. Not only does it lend a smoky flavour, but the sugar content helps the onions to caramelize beautifully.